It was a frustrating day for the competitors at ISAF Sailing World Cup Weymouth and Portland with a mischievous breeze dancing across the British waters. Constantly changing, a sailable breeze never truly materialised. 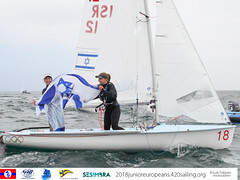 The Race Committee team on the Men's 470 race course managed to get one race away, but aside from the RSX Men who got in one race too, the remaining classes were left frustrated with no racing. 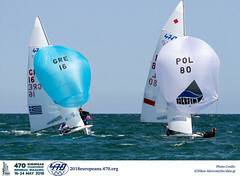 The young French team of Guillaume Pirouelle and Valentin Sipan managed to take the Men's 470 race victory with an astute performance. They took the lead from the off and at one point had opened up a lead in excess of two minutes. A chasing pack closed the gap and passed the French team but they held on tight to seal the bullet. "It was quite light and shifty," explained Pirouelle. "We didn't know what would happen but we managed to get a few things right. We had quite a good start. We tacked immediately to take a right shift and after that we stayed focus on the race. "It's quite complicated for us because it's only our third year in the 470. It's a big event for us as well because we're racing against the big sailors and we have to sail well at all times." Taking a bullet in a fleet that features the world's leading Men's 470 sailors such as Mat Belcher and Will Ryan (AUS), Luke Patience and Elliot Willis (GBR) and Sime Fantela and Igor Marenic (CRO) does not come around that often. Pirouelle was pleased to finish ahead of them but knows there are a lot of hours of hard work ahead to reach their level, "It's amazing to see them and sail with them. They are very good and I hope we will be like them in the next few years. Tomorrow I think it will be more windy. We are quite good in strong wind. We have to sail fast and we will see what happens in the different conditions." 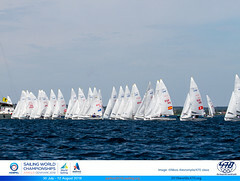 The French team sit 16th overall and just ten points off the Medal Race positions. Three Men's 470 are scheduled for Saturday 13 June with plenty of points to play for. New Zealand's Paul Snow Hansen and Daniel Willcox followed behind the French pair by 38 seconds to take second and remain in the hunt for top honours. They sit second, nine points off leaders Stu McNay and Dave Hughes (USA). Those around them used up their drop but for the Kiwis, a disastrous result on the third day of competition could have dented their chances as Willcox explained following a large bite of a fully loaded chicken wrap after racing, "The first race of the regatta we were black flagged so since then we used our discard up and have had to keep our consistency and keep some good results under our belt. We've managed to do that and we look to do that going forward as well." The Kiwis worked their way up the fleet throughout the race, moving up the ranks from 12th to second. Willcox continued, "It was a pretty tricky race and very changeable from the start to finish. We kind of had a trend to the right, like the forecast model said and we had to deal with the right shift with the pressure as well. "We did a pretty good job. There were lots of snakes and ladders throughout the race so we were keeping our boat point towards the mark and doing the simple things right and it paid off quite well so we're happy." Americans McNay and Hughes recorded a 17th, which they use as their drop. They continue to lead on nine points followed by the Kiwis on 16 and Mat Belcher and Will Ryan on 20.